We have all been told at one point in our lives not to play with our food. Fortunately, designer Miguel Valenzuela didn’t listen to this warning –and has created a new version of his creative food innovation: the PancakeBot. 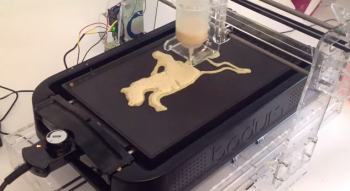 The PancakeBot is a device that designed to 3D print customized pancakes that are essentially pieces of art -that hold their perfect shape every time. It all started back in 2010, when Miguel was reading a magazine article about a British designer who created a model of a pancake-stamping machine out of LEGO bricks. He told his oldest daughter about the model, who in turn told her 3-year-old sister that their dad was going to make a pancake machine out of LEGO bricks. Not wanting to disappoint, Miguel set to work building just that. Six months later, the first version of the PancakeBot was born. In 2012, Miguel and his wife took the LEGO version of the PancakeBot to the World Maker Faire in New York City; the results were amazing, and Miguel was inspired to design the new PancakeBot. The new model is not made from LEGO bricks, instead sporting a shiny new acrylic body. It’s also more accurate, allowing for creations as complex as the Eiffel Tower to be made –in a slightly smaller version of course! The new PancakeBot made its debut at the Bay Area Maker Faire held at the San Mateo Event Center last weekend.